That might be it for today but there's still a lot more to come from this FA Cup second round. Ten more games in fact and you'll be able to follow them all here, with our live text kicking off at 11:00 GMT giving you all the build up to Gateshead v Warrington (12:00 GMT) and all the other ties. FA Cup highlights page here. Former Wrexham midfielder Barry Horne tells BBC Wales: "Maidstone have given us a snapshot of what they're about here. They're second in the Isthmian League with games in hand and if they do anything akin to form in those games they'll be well on top. They've put in a fantastic effort and are a credit to their division. They showed good skill and most importantly, they kept going forward." So, that's it for today's action. The third round dream is over for Maidstone, MK Dons, Oldham, Plymouth and Shrewsbury but Wrexham, Chesterfield, Doncaster, Sheffield United and Preston will all be looking forward to Monday's draw knowing they're guaranteed to be involved. Accrington and Yeovil, Luton and Bury, Cambridge and Mansfield and Oxford and Tranmere will have to do it all again to see who will join them. Manny Smith's first half strike and a double from Andy Bishop send Wrexham into the third round. Alex Flisher's goal, with his side 2-0 down and down to 10 men after Aaron Simpson's red card, proved to be in vain. The visitors put in a tremendous performance but the hosts deserve credit for the professional way they went about their task throughout. It's back to the battle to get promotion to the Conference South for them while Wrexham will be eagerly awaiting Monday's third round draw. Former Wrexham midfielder Barry Horne: "That surely settles it. The most noticeable thing about the goal was the space that opened up down both flanks. Maidstone are clearly tiring with 10 men. "Who do Wrexham want in the next round? I'd take another non-league side at home. If not, how about Everton?" Horne lifted the FA Cup with the Toffees in 1995. Game over. Andy Bishop gets across his man at the near post and heads past Lee Worgan from sub James Pearson's cross. The 10 men of Maidstone are still battling hard but it seems that Wrexham might just have weathered the storm. The Stones take on Leatherhead in the league on Tuesday and you'd imagine there'll be some tired bodies out there that night. It is non-stop at the Racecourse Ground. Wes York drags a low effort just wide for Wrexham and the visitors nearly equalise up at the other end as Jamie Rodgers sends a crisp 25 yarder just past Jon Flatt's post. Manny Smith gets up brilliantly from Wrexham's first corner of the second half. His header looks goalbound but Maidstone scramble it away. Smith hadn't scored this season before today. For all that these two sides are two divisions apart, they are only actually separated by 36 places. Maidstone might be down to 10 men but their body language is certainly not that of a beaten team. You sensed Maidstone would not go quietly and they are right back in this. Alex Flisher looks to be claiming it as he bundles home Sonny Miles' low centre. In truth the second goal is a touch harsh on the Stones. Moments before the penalty decision they got in behind the home defence only for Jon Flatt to deny Alex Flisher one-on-one. It's a long way back for Maidstone now. Wes York gets in behind the Stones defence only for Aaron Simpson to bring him down in the area. The defender sees red and from the resultant penalty Andy Bishop makes it 2-0. Jack Parkinson has been heavily involved for the visitors and his header from Alex Flisher's huge throw hits the crossbar. That's as close as the Isthmian side have come. Worth noting of course that Maidstone are made up of part-time players. Glazer Tom Mills bursts forward from full-back but can't keep his 10-yard volley on target from the angle. Down the other end, Jay Harris slips Andy Bishop in on goal and the striker dinks a neat effort just over the crossbar. No changes by either side at half-time. Maidstone have 45 minutes to join Blyth Spartans in flying the seventh-tier flag in Monday's third-round draw. Former Wales international Iwan Roberts tells BBC Wales: "Losing three or four is nothing in the FA Cup, Maidstone might as well go out fighting. They've got to score a goal and I'd be surprised if either team changes anything at half-time." A reminder that the BBC Sport website is the place to watch all of today's FA Cup goals. Click the highlights tab now to catch up on today's action. Just looking at the Manny Smith goal again and Maidstone keeper Lee Worgan was appealing for a foul after it went in. Have to say it looked to me like it was his own player, Jack Parkinson, who got in the way. Earlier, MK Dons were defeated 1-0 by Chesterfield thanks to a second-half goal from Armand Gnanduillet, and MK boss Karl Robinson was clearly not pleased with his side's performance. "It was shambolic," he told BBC Three Counties Radio. "We were beaten by the better team today, Chesterfield had more energy and quality in the final third. We were lucky to lose 1-0. "I don't think any player on the pitch can come out with any credit today, I really don't. Their keeper has not made a save at the Stadium:MK, which is not like us. "We looked dull, we didn't look like we won second balls, set-pieces were diabolical. We were by far second best in every single department. Former Wrexham boss Dean Saunders on BBC Wales: "There are mismatches all over the pitch and Wrexham are a different class. If I were Maidstone boss Jay Saunders, I'd change the system a bit and maybe put another man in midfield. At this rate Wrexham could win by three or four. "They just need to be sensible and not take risks." Wrexham boss Kevin Wilkin tells BBC Wales: "We need to keep our game nice and short and keep moving the ball on the deck. The second goal is absolutely crucial, we need to get a bit of a cushion between us and them, one goal isn't enough really." Manny Smith's goal is the difference between the two sides at the break. Despite trailing, you sense Maidstone will not be too unhappy with their work so far. Alex Flisher and Jack Parkinson have both forced saves from home keeper Jon Flatt but the hosts have, predictably, had more of the ball. Clubs throughout the country have today been taking part in #footballremembers, which marks 100 years since the 1914 Christmas Truce match. This photo was tweeted by Bury after their draw with Luton Town earlier this afternoon. Goalscorer Manny Smith is in the book for taking out Maidstone winger Matt Bodkin 28 yards from goal. Frannie Collin's free-kick comes to nothing. Wrexham are just trying to calm things down now. Maidstone are looking most likely when they get the ball forward quickly on the counter attack. Former Preston striker Callum Robinson: "Good to see the lads get through to the next round of the FA Cup. Well done"
Robinson scored a hat-trick to help Preston beat Havant & Waterlooville in the first round before being recalled by parent club Aston Villa. Just a recap of today's earlier results, with League One side Sheffield United still on course to match last season's run to the FA Cup semi-final - surely they can't do it again, can they? Bit of a stoppage here as Maidstone striker Jay May gets some treatment for a knock to the thigh. Looks like he's going to give it a go and the players are all using the break in play to take on some fluids and get their breath back. It's been frenetic so far. Heads in hands for Maidstone. Terrific attack down the left-hand side sees the ball played across the box for Jack Parkinson but Jon Flatt manages to keep his low effort out with his legs. Former Wrexham midfielder Barry Horne tells BBC Wales: "What Wrexham don't need to do is sit back, they've been totally dominant so far - they really need to get a second." In the Premier League's late match, Manchester City have just taken the lead against Everton courtesy of a Yaya Toure penalty. You can read updates of that game, plus reaction to the earlier kick-offs, here. Shrewsbury Town manager Micky Mellon saw his side press and press for an equaliser at Preston, but to no avail, and he was disappointed to not get at least a goal in the 1-0 defeat. "I think that we didn't do enough in the first half, we were yards off the pace and if I'm honest all over the place," Mellon told BBC Radio Shropshire. "But in the second half, we passed it around superb and we are disappointed to have allowed the cross in, to allow them to score at head-height so we were punished by one mistake. "We probably had total control in the second half but we just didn't have the cutting edge and composure needed to get back on level terms. "We changed the system, and they had to change things to match us as we were getting the better of it - but their smartness was needed to score." Lee Worgan has been terrific in the Maidstone goal so far but he will not want to see this again. He palms a corner down to the edge of the six-yard box and former Walsall defender Manny Smith throws himself at the ball to send it over the line (just) via the crossbar. Alex Flisher fires an excellent low volley at Wrexham's goal but Jon Flatt is equal to it and the visitors can't quite scramble the ball over the line in the melee that follows. tells the club's Twitter feed that it was the Shakers' togetherness which contributed to their draw - which came thanks to a 90th-minute equaliser. "Their defenders were putting bodies on the line but the goal was coming," Lowe said. We have to live with the decisions the gaffer makes but fair play to Nards for coming on and scoring. "As far as I'm concerned, this is one of the best competitions in the world and I've always wanted to be part of it. I've been in teams when fellow strikers are waiting for you to mess up - there's none of that here. The mood around the place is second to none - we've had a few bad results but we're looking to kick on from here." Real open feel to the tie at the moment. Wrexham are looking like the dominant force but Maidstone aren't afraid to try and play when they get a chance to get on the ball. Mind you, Stones keeper Lee Worgan has already been forced into four saves. Big save from Lee Worgan. Mark Carrington bursts into the area but the keeper comes out to smother his effort. Moments later Conor Jennings heads wide from eight yards. All Wrexham early on. Andy Bishop goes close to giving the hosts an early lead. He drills his half-volley from Wesley York's centre into the ground and just past the post. We're under way at the Racecourse Ground. There'll be some nerves out there. There's so much at stake for these two teams. Luton thought they had booked their place in the third round against Bury, only for victory to be snatched out of their hands via a 90th-minute Daniel Nardiello goal. Less than five minutes until kick off at the Racecourse Ground now. Maidstone started their FA Cup journey on 13 September with a 10-0 win over Littlehampton. Can they stretch their amazing Cup run into 2015 or will the Dragons end the dream tonight? There is a serious financial gain to be made by non-league teams who can go on a run in the FA Cup and Maidstone already have big plans for their unexpected windfall. A new striker? Not quite. The Stones have decided to invest their money in a new stand. told BBC Radio Kent: "Some clubs throw all their money into the playing squad and it all evaporates," Casey told BBC Radio Kent. "In years to come the stand will be built on the basis of the 2014 Cup run. "In the first qualifying round we won 10-0 against Littlehampton and it has grown and grown from that. There will be a legacy of all the wonderful hard work these players have put in." Plymouth Argyle have tweeted this photo of manager John Sheridan speaking to the press after their defeat at Bramall Lane. Accrington Stanley boss John Coleman tells BBC Sport after his side's 1-1 draw with League One Yeovil: "Although I'm disappointed we haven't won, I'm pleased with what we did in the second half. "Yeovil are a decent side but we've been putting into our lads this week we could threaten them, and we did. We pinned them back and pinned them back. "We could have had a couple of penalties, and for the second the lad would have been sent off had he given it." Maidstone might have killed off a relative giant as recently as last month but Wrexham have a pretty proud history in the competition as well. Mickey Thomas fired home a memorable free-kick as they beat Arsenal 2-1 in 1992 and the Welsh side will be keen to make the third round again. A 90th-minute Daniel Nardiello equaliser gave Bury a 1-1 draw at home to Luton, and Shaker boss David Flitcroft seems pleased with the mettle of his side. "Their goal could have deflated us but we carried on and dug in," he told the club's Twitter feed. We found it hard to break them down but we kept fighting - that pleases me." On sending up goalkeeper Rob Lainton for the corner that lead to the goal: "At that point, we had nothing to lose - it was another body for them to deal with"
Check out the dancing feet for Accrington's goal followed by an old-school pile-on. Maidstone United were reformed in 1992 after the old club went bankrupt. Frannie Collin's late header against League Two Steveange means the seventh tier side travel to Wrexham for their first second round tie. Luton Town fan Ahmed: Luton hitting the post proved costly as Bury took full advantage. On the balance of play, the Shakers deserved draw. "I think Wrexham expect to win today. With Maidstone, they've had great results at home on their 3G pitch, but it's a little bit more difficult when you go away. 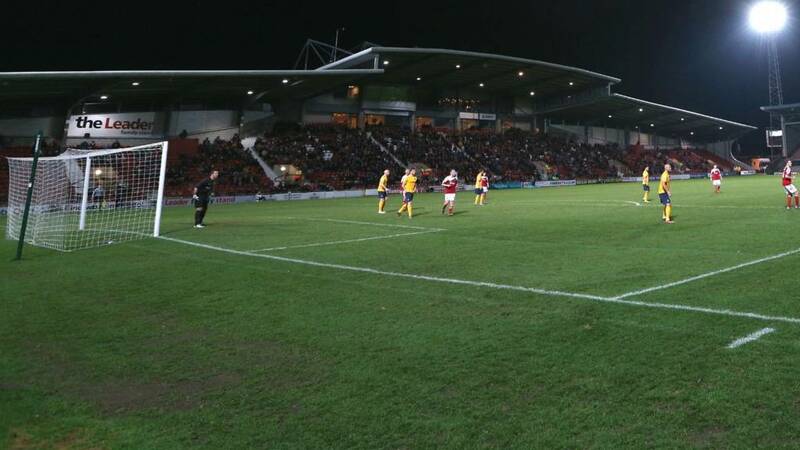 Wrexham will definitely fancy their chances." Manchester City versus Everton match here. Well how about that? Drama at the end of the Cambridge-Mansfield and Bury-Luton games, as well as a comfortable win for last season's FA Cup semi-finalists Sheffield United. And that's not the end of the FA Cup action today. We have Conference side Wrexham taking on Maidstone United of the seventh tier in around half an hour's time. Wrexham XI: Flatt, Carrington, Ashton, Smith, Hudson, Clarke, Harris, Bishop, York, White, Jennings. Maidstone United XI: Worgan, Simpson, Mills, Coyle, Miles, Rogers, Bodkin, Parkinson, May, Collin, Flisher. Big stoppage at the end but Chesterfield comfortably see the added time out and they're through to the third round for the first time since 1997. Final chance for Cambridge from a corner but it is flicked away by a Mansfield head and the referee blows his whistle for full-time. The Blades' treble against Plymouth Argyle this afternoon is their first since a 3-2 win over Colchester United on 16 September. Waves of Cambridge players going towards the Mansfield goal and Ryan Donaldson has a strike tipped over the bar. Just when Luton look to have done enough Daniel Nardiello pops up to scramble the ball over the line in a melee and almost certainly send this tie to a replay. What did I just say? Kwesi Appiah takes advantage of some confusion in the Mansfield defence to bury the equaliser and gets booked for his over-zealous celebrations. Sorry Mansfield fans, I think I just put the kiss of death on you. Kwesi Appiah is so close to the equaliser to break Mansfield hearts, but Sascha Studer pulls off a fine save to his left. That may be it. Marc McNulty, recently back from injury, wraps up the victory for the Blades from close range. Bury get lucky there. Ricky Miller's fine strike hits the post and falls gratefully into the clutches of Rob Lainton. Aston Villa loanee Enda Stevens puts a dangerous cross into the Latics box and defender George Elokobi diverts the ball into his own goal. Doncaster going through? Blades striker Marc McNulty battles to win the ball on the edge of the Plymouth area but, having done the hard work, pushes his shot wide. Accrington clearly don't want a replay down in Somerset and Shay McCartan's downward header looks destined for the back of the net, but comes back off the foot of the upright. Could not have been much closer. Paddy Kenny makes a wonderful stop to deny Theo Robinson what could well have been a Doncaster winner. Luton Town fan JP: If Luton manage to win I wouldn't mind an easier match in the next round. Arsenal, perhaps. BBC Sport's Seth Bennett: Hello, cup tie here, 1-1. It's been all Accrington since the break. Yeovil are on the ropes. Chesterfield battling hard to retain their lead. The Spireites have won one second round tie in 34 years... Could this be number two? Mansfield have been under tremendous pressure at the back in the second half, but they take the lead in quite fortuitous circumstances. Rob Taylor hits a hopeful free-kick into the area and it is headed into his own net by Tom Champion . This could be a winning start for new full-time Stags player-manager Adam Murray. Still no goals at Boundary Park. Both teams have made changes but we're heading back to the Keepmoat to do it all again as it stands. Preston have the chance to make it game over at Deepdale from the penalty spot when Paul Gallagher is clipped in the box, but the forward smashes his penalty way over the crossbar. Could he be made to pay for that dreadful effort? MK Dons pressing for a leveller and substitute Giorgio Rasulo's low effort goes just wide of Tommy Lee's goal. Matty Blair goes close for Cambridge with a looping effort that is saved well. Mansfield seem to be slowing down the play, potentially hoping for a home replay. Jason Koumas rolls back the years to level for the visitors. The former Wales international picks the ball up outside the area, beats a man and curls home a lovely effort. Looks like the Blades have done enough here now. Plymouth make a couple of changes in an attempt to get back into the game with Oliver Norburn and Lee Cox coming on for the visitors. Shrewsbury have the ball in the net through James Collins, but the striker is judged to be in an offside position. Smart finish, nonetheless. The visitors are controlling the game well. Eoin Doyle, who earlier had a goal ruled out for offside, forces a fine save from the Dons keeper David Martin. Shrewsbury are not going to give up without a fight at the team in the division above them and Bobby Grant's free-kick forces a good save from Preston goalkeeper Thorsten Stuckmann before Town's James Collins has a shot cleared off the line. They have been knocking on the door, and having had a penalty shout turned down a few minutes ago, Tom Aldred brings hosts Accrington level against their League One opponents. The defender dances through the Yeovil defence as if they weren't there and finishes into the far corner before being bundled by his team-mates. What a turnaround at the Kassam. And it's that man Tyrone Barnett again, the striker racing onto a through ball and shooting low past Tranmere keeper Owain Fon Williams. Tale of three penalties at Bramall Lane. Jose Baxter scores his second spot-kick of the day, after Curtis Nelson fells Jamie Murphy in the area. The Pilgrims will be ruing the penalty that Reuben Reid missed for them at the start of the second half. So that little flurry of goals means the only tie currently goalless is the one between the two sides at Boundary Park. The hosts are currently on top but Rovers are holding out at present. Bury fan Ahmed: That was a poor goal conceded by Bury. Oxford back in it at the Kassam as Tyrone Barnett rises highest at a corner to head in an equaliser in the all League Two affair. The big man Armand Gnanduillet puts Chesterfield ahead at Stadium MK, heading in Sam Clucas' delightful cross from six yards. MK Dons knocked Manchester United out of the League Cup earlier this season, will their part in this season's FA Cup be over come 17:00 GMT? Sheffield United take the lead through Jose Baxter's penalty. The former Everton man slots home from 12 yards after Marc McNulty is fouled in the area by Ben Purrington. Luton take the lead at their League Two rivals Bury. Scott Griffiths takes advantage of some poor defending to tee up Mark Cullen for his ninth goal of the season as the goalkeeper and defender leave it for each other. Handbags at the Crown Ground after Accrington's Matt Crooks goes studs up for a 50-50 ball with Yeovil keeper Jed Steer, and the striker is yellow carded for his troubles. Jay O'Shea comes close to giving the visitors the lead against his former side but his 25-yard effort from Arrmand Ganduillet's lay-off drifts over the bar. Chesterfield FC: Here are the magnificent Spireites away fans at Stadium MK today. The hosts should be level but Callum O'Dowda sidefoots wide from Danny Hylton's cutback. Accrington have a phenomenal chance to draw level when the ball drops to Matt Crooks, who has time but hits it straight into the arms of the Yeovil goalkeeper. Huge let off for Sheffield United as Reuben Reid misses a spot-kick after Jay McEveley fouls Lewis Alessandra in the area. The oranges are finished, the energy drinks have been taken on and the managers' words are ringing in the players' ears. We're about to get under way for the second half of our eight 15:00 GMT kick-offs. Over in the Premier League, the only goals that have come are at the Britannia Stadium, with a Bojan-inspired Stoke beating a sorry Arsenal 3-0.
via our live text service here. Maidstone boss Jay Saunders is serving a touchline ban today so Southall will be barking out the orders from the dugout. There is plenty to keep us busy for a while yet, including one game at 17:30 GMT. And if there's any one team who can take inspiration from Blyth's antics yesterday, it's Maidstone United. dumped Stevenage out in the first round, travel to Wales looking to join the Spartans in representing the seventh tier of English football in the third round. The Isthmian Premier Division club will be looking to shock Kevin Wilkin's Conference side, themselves no strangers to an FA Cup surprise. Mickey Thomas hammered home a famous free-kick to help dump Arsenal out of the Cup at the Racecourse Ground. Half-time in our eight 15:00 GMT kick-offs, and we have a few goals to keep us talking. Cambridge's Luke Chadwick pegged back Mansfield's early goal to see their side level 1-1 at the break, while Yeovil, Tranmere and Preston are all leading 1-0. The U's trail at half-time to Cole Stockton's excellent finish from a low cross. Michael Appleton's side have responded well to going a goal behind but have nothing to show for their efforts. Former Stoke and Sunderland winger Liam Lawrence has been the focus of much of Shrewsbury's play at Deepdale, and he sees a shot saved by Preston goalkeeper Thorsten Stuckmann. The League Two side have certainly grown into the game. Can they find a way back before half-time? Sheffield United are still struggling to create any chances of real note against their League Two opponents. The Blades have picked up just one point from their last two League One home matches and boss Nigel Clough spoke of the importance of getting back to winning ways at Bramall Lane before the game. Plymouth Argyle: Oooooooooh! Blizzard flashes a shot wide after a shimmying little run from Banton. Plymouth Argyle: Run from Banton saw him beat three players, including - briefly - himself! Oldham had been on the backfoot in their all League One encounter with Doncaster but the hosts have just had a couple of chances of their own. First Jonathan Forte has his volley saved by the Sam Johnstone and, at the second attempt, Jabo Ibehre smashed over from eight yards. Still no goals in Milton Keynes but plenty of attacking football on display. Spireites striker Armand Gnanduillet should pull back for a team-mate to slot home but instead finds a Dons defender who clears away. Don't see this ending 0-0. We have a save at Bury! But it's a routine one for Luton's Mark Tyler as he gathers a strike from Hallam Hope easily. Kwesi Appiah goes close to putting hosts Cambridge in front for the first time in the game, but his 12-yard shot goes just wide of the post when he perhaps could have done better. Almost immediately, Mansfield Rakish Bingham should have had his second of the afternoon, but heads well over from a great position. He'd gone close minutes earlier and now Cole Stockton gives Tranmere the lead at Oxford. Shamir Fenelon fires in a cross and the forward does brilliantly to flick the ball in. League One Yeovil have taken the lead against the side a division below them as on-loan Jordan Clarke heads home a perfectly weighted free-kick from the left following a great run by Sam Foley. Goalless in the game between the two League Two strugglers. It's been fairly even at the Kassam, with Cole Stockton firing just wide for the visitors. Yeovil are trying to assert their authority at Accrington and could have taken the lead when the ball broke to Sam Foley, but his shot is easily gathered by the Stanley goalkeeper. League Two Plymouth nearly capitalised on a defensive error but forward Jason Banton couldn't quite get the shot on target. It's all going off at Cambridge, as Kwesi Appiah is denied by Mansfield goalkeeper Sascha Struder after good work from goalscorer Luke Chadwick. Meanwhile, at the other end Rakish Bingham cannot connect properly with a Rob Taylor cross. Tommy Lee again called into action. League One's player of the month for November Carl Baker cut in on to his right foot just inside the area and curled a low effort towards goal that the Spireites keeper did well to beat away. Moments later Dean Lewington hits a 25-yard free-kick just over the bar for the hosts. Plymouth Argyle: Love a pass, do Sheffield United - Argyle needing patience and concentration. League One promotion chasers United are enjoying the lion's share of possession so far at Bramall Lane. Still Doncaster doing most of the pressing at Oldham. Veteran keeper Paddy Kenny is forced into a fine save by Rovers striker Theo Robinson. Yeovil Town: Town now have two players without names and numbers on their backs. Lucky kit man Dan packed extra shirts! Glovers pair James Berrett and Stephen Arthurworrey have both been in the wars so far at the Crown Ground. It had been all Chesterfield but MK Dons have just shown their quality. Striker Benik Afobe is thwarted by Spireites keeper Tommy Lee before Dele Alli curls the rebound narrowly wide of the target with the goal at his mercy. Preston take the lead, and it's not through Beckford, but the unlikely source of centre-back Paul Huntington. The Shrewsbury defence failed to deal properly with a Paul Gallagher corner, and the defender smashes home for the second successive weekend. Jermaine Beckford - a man who has scored more FA Cup goals than hot dinners, almost puts Preston ahead, but fires wide under pressure from a Shrewsbury defender. The visitors, meanwhile, are being forced to make a change after James Wesolowski goes off the pitch and is replaced by Jordan Clark. Goalless at Gigg Lane between the two League Two sides. Everton loanee Hallam Hope has caused some confusion in the Luton box but no goals yet. Still no sign of a break in the deadlock at Boundary Park. The visitors have had a couple of early chances through Reece Wabara and Curtis Main. Matt Crooks could, and perhaps should have given Stanley the lead there. Played through on goal the Huddersfield loanee pokes narrowly wide as Yeovil keeper Jed Steer rushes out at him. Meanwhile, Stephen Arthurworrey becomes the second Glovers player to go off briefly for a nosebleed. They aren't contagious are they? We could have a real stonker on our hands at the Abbey Stadium, as boyhood Cambridge fan Luke Chadwick draws his side level. The former Manchester United and Stoke winger is put through one-on-one with Sascha Studer and makes no mistake. The Blades almost take an early lead against the Pilgrims but keeper Luke McCormick reacts wonderfully to keep out Ryan Flynn's effort. Gruesome scenes at the Crown Ground as James Berrett goes off the pitch for a change of shirt with blood pouring out of his nose. Nice. Bright start by the visitors and striker Armand Gnanduillet forces a corner after a strong run but the Spireites can't force anything from it and MK Dons clear. Sheffield United fan Mark has tweeted this picture of the Blades and Plymouth Argyle before kick off today. Shrewsbury boss Micky Mellon was hoping his side could cause an upset today and striker James Collins comes close to giving them an early lead at Preston, his 25-yard shot drifting just wide. What a start for Mansfield's new full-time manager Adam Murray! Murray has given a start to Rakish Bingham, who scores his first goal since September, heading home Rob Taylor's left-wing cross to give his side the lead at the Abbey Stadium. Can Richard Money's side recover from this early set-back? First shot of the day goes to Yeovil, as Joe Edwards's low shot is easily gather by Stanley keeper Jack Rose. We're under way in all of our 15:00 GMT games. Fasten your seatbelts. Here we go. This week is 'Football Remembers' week in remembrance of the Christmas Football Truce. Across the country teams are commemorating this before kick-off, and at Oxford and Accrington it is no different, with both teams coming together for a huge group photo. We haven't got much longer to wait for our 15:00 GMT kick-offs. Ready for a 'cupset' anyone? Blyth Spartans supporter Anna: After Blyth's win, I've just cancelled the family holiday as I would have been away for the third round - can't have that! Blyth shocked League Two side Hartlepool last night to book their place in the third round. #bbcfacup or, alternatively, you can text us on 81111. "Accrington face Yeovil for a place in round three for the first time since 2009-10. A hardy group of fans have made the 500-mile journey up from Somerset. "Today Yeovil's James Hayter makes his 700th career appearance. Hayter is a player who knows what it takes to win at Wembley as he scored the only goal of the play-off final when Doncaster Rovers beat Leeds United 1-0 in 2008." Plymouth Argyle: Lads are down there somewhere! Plymouth Argyle players warm up in the deceiving Bramall Lane sunshine. According to BBC Weather, Sheffield is a spine-tingling 5 degrees currently... Makes me shiver thinking about it. Over in the Premier League, Newcastle have just beaten league leaders Chelsea 2-1, with Papiss Cisse scoring both of the goals for Alan Pardew's side. One final reminder that our BBC local radio teams are braving the cold to bring you the FA Cup this afternoon, and will be proving full commentary on all of the 15:00 GMT kick-offs. Doncaster Rovers: Wellens, Wabara and Furman returning to Oldham today. It is also Paul Dickov's first visit here since he left the club in 2013. A handful of familiar faces head back to Boundary Park with Doncaster this afternoon. Will it be a happy hop over the Pennines for them? Chesterfield fan Gary: Newport Pagnell is full of travelling Spireites! The Chesterfield fans stop for a refuel en route to MK Dons. How very civilised! That's all your team news for the days 15:00 GMT kick-offs. The players' nerves will be jangling, hoping for the prospect of coming up against Premier League players like Diego Costa, Wayne Rooney or Michael Kightly in the next round. Final Score is getting under way now on the Red Button and online. Presenter Jason Mohammad is joined by Garth Crooks and Andrew Cole as they guide you through all of the afternoon's goals. MK Dons XI: Martin, Spence, Kay, McFadzean, Lewington, Potter, Alli, Powell, Grigg, Baker, Afobe. Chesterfield XI: Lee, Darikwa, Morsy, Ryan, Gnanduillet, O'Shea, Roberts, Clucas, Raglan, Doyle, Margreitter. Preston North End XI: Stuckmann, Wiseman, Clarke, Huntington, Buchanan, Welsh, Kilkenny, Humphrey, Reid, Gallagher, Beckford. Shrewsbury Town XI: Leutwiler, Grandison, Woods, Goldson, Collins, Lawrence, Wesolowski, Knight-Percival, Passley, Grant, Akpa Akpro. tweeted a picture of their players being put through the paces at Oxford. I'll tell you what, I hope the heaters are on full blast in the dressing room in this cold, or else they'll have cooled right down by the time they kick-off. James Hayter makes his 700th career appearance today - a mighty fine achievement for the former Bournemouth and Doncaster man. Accrington Stanley XI: Rose, Winnard, Aldred, Atkinson, Liddle, Joyce, Procter; McCartan, Naismith, Mingoia, Crooks. Sheffield United XI: Howard, Harris, Basham, Flynn, Doyle, Muphy, Scougall, Baxter, McEveley, Campbell-Ryce, Higdon. Plymouth Argyle XI: McCormick, Mellor, Purrington, Nelson, Alessandra, Banton, Reid, Blizzard, Kellet, O'Connor, Hartley. Cambridge XI: Dunn, Tait, Taylor, Coulson, Champion, Hughes, Nelson, Appiah, Chadwick, Kaikai, Bird. Mansfield XI: Studer, Sutton, Riley, Tafazolli, Beevers, Lambe, Clements, Heslop, Taylor, Bingham, Oliver. The Hatters travel to League Two rivals Bury today with boss John Still saying a potential promotion to League One is more important to him than another run in the FA Cup. Bury XI: Lainton, Jones, McNulty (c), Tutte, Hope, Adams, Rose, Mayor, Soares, Cameron, Mills. Luton Town XI: Tyler, Wilkinson, McNulty, Franks, Griffiths, Harriman, Doyle, Smith, Drury, Walker, Cullen. Kidderminster fan Lewis: As a Harriers fan my greatest FA Cup moment was when we played Sunderland in the fourth round last season. Beckford starts today as his side take on League Two Shrewsbury. Oldham Athletic XI: Kenny, B.Wilson, Kusunga, Elokobi, Mills, Kelly, Winchester, Johnson, Forte, Philliskirk, Ibehre. Doncaster Rovers XI: Johnstone, Robinson, Main, McCullough, Butler, Stevens, Keegan, Wellens, Wabara, Bennett, Coppinger. Plymouth fan Jodie: My Argyle Birthday cake! Hopefully our boys can get us a win today to make my 21st birthday awesome! Can John Sheridan's men make Jodie's birthday one to remember? Or will last season's FA Cup semi-finalists Sheffield United turn party poopers at Bramall Lane? replacing him almost two years ago. a famous FA Cup win over Premier League giants Liverpool before leaving the club, a feat Johnson couldn't emulate last season when his side went down 2-0 at Anfield. Johnson, son of Yeovil boss Gary Johnson, admitted the visit to the Reds wasn't as enjoyable as he might have hoped. He told BBC Radio Manchester: "It's got a bit of a story there obviously with Paul Dickov being a former manager but the main story is a club like ours loves, and needs, a cup run. "Last year the Liverpool game was worth in excess of £400,000 and I've never felt so much pressure in my life on that day." Team news from that game is coming shortly. Oxford United XI: Clarke, Riley, Mullins, Wright, Holmes-Dennis, Rose, Whing, Hylton, O'Dowda, Collins, Barnett. Tranmere Rovers XI: Fon Williams, Holmes, Donacien, Holness, Ihiekwe, Ridehalgh, Power, Jennings, Jahraldo-Martin, Stockton, Fenelon. If you're toying with heading down to the Abbey Stadium to watch Cambridge take on Mansfield today then don't forget your hat. And scarf. And coat. And maybe a hot water bottle. BBC Radio Cambridgeshire have just shared this picture on Twitter of a rather frosty looking pitch. Team news for our 15:00 GMT kick-offs are about to start flooding in. We'll bring all the news to you as and when we get it, no matter how big or small. After their near-miss against Chelsea in October, Mellon is hopeful that his side can cause an upset when they visit League One Preston. BBC Radio Shropshire: "We know Preston are a good side but so are we. It will be a great test for us to see how far we have come against a side riding high in the league above. "It is a benchmark for ourselves against the third best team in League One. It gives us another opportunity to see how far we have come as a group. "We want to be excited for being in the hat for that third round because that's when the big boys start to come in." Preston striker Jermaine Beckford is looking to make the Lillywhites the sixth different team he has scored for in the FA Cup in the last six seasons. on-loan Bolton man bagged for Wanderers last season having scored for Huddersfield, Leicester City, Everton and Leeds in the last four. pushed Premier League leaders Chelsea all the way in the League Cup in October. Micky Mellon's side are third in League Two and have kept clean sheets in three of their last four games. Accrington fan Nicola: Me and my dad are going to watch Stanley today. We must be mad - I'm cold just sat in the house! You're a braver soul than I, Nicola. Today's teams will all be hoping to reach the third round, where they could play a money-spinning tie against one of the Premier League's big names as they join the competition. Who knows, we could see Sergio Aguero at Accrington. To find out what will happen you can watch the draw for the third round from 19:00 GMT on BBC Two and the BBC Sport website on Monday from the Deep Aquarium in Hull. Less than two years ago Doncaster boss Paul Dickov was Oldham manager as the Latics pulled off one of the great FA Cup shocks of recent times. 3-2 defeat at Boundary Park. Fate drew the two sides together again last year but there was to be no repeat as the Anfield side ran out 2-0 winners against Lee Johnson's men. Dickov brings his Doncaster side back to his old stomping ground looking to stretch their current unbeaten run to five matches. Are any brave souls off to a game in the freezing December cold? How do you think your side will get on today? Do you have an FA Cup selfie you'd like to share? #bbcfacup or, alternatively, you can text us on 81111 with your views. Chesterfield boss Paul Cook is looking to guide the Spireites through a second round-tie for just the second time in 34 years. However, the one time they did manage that feat they ended up losing to Middlesbrough in the semi-finals in 1997. The Spireites take on a side who have scored 16 goals in their last six matches but Cook says his side will not be set up just to avoid defeat. He told BBC Radio Sheffield: "I don't believe in taking steps back so we will be taking the game to them and doing the best to try and win the game. "You have to believe that you can win and the most important thing is that we get our supporters off their seats." His side are enjoying their best start to a season in six years and this could very well be the year they finally earn promotion to the second tier. Today's opponents, fellow League One side Chesterfield, have seen the wheels fall off a little after a strong start to the season. hammer non-league Braintree 6-0 in the first round of this competition. Adam Murray for the first time today against Cambridge following Cox's departure. The 33-year-old is the youngest boss in the Football League and Premier League, three-and-a-half months younger than Oldham boss Lee Johnson, whose side are also in FA Cup action today. Cambridge are enjoying life back in the Football League after a nine-year absence. despatched League One Fleetwood in the first round. Mansfield, who were promoted back to the Football League in 2013, have had an altogether tougher start to the campaign. Conference South side Concord Rangers. The Shakers take on League Two rivals Luton at Gigg Lane today. However, that was their last win and a run of four successive defeats means they've dropped off the pace in the League Two promotion race. Unlike their opponents today, Luton are sitting pretty in the top three of the bottom tier of the Football League after promotion in May. beat Premier League Norwich City on their way to the fifth round. This time last year Gary Johnson's Yeovil were a Championship team for the first time in their history. A third-round berth was guaranteed. This year they're having to earn their place there the hard way. The Glovers, currently 23rd in League One, saw off Crawley in round one but may find a trip to Accrington a tougher proposition. shocked Notts County in their first round replay to reach this stage. We've already given you a taste for some games, but for those of you who may not know the ins and the outs of lower-league football, your Pelly Ruddock Mpanzus from your Danny Hyltons; it's time to give you some scene-setters ahead of today's fixtures. Just a reminder of the breaking news from earlier today - League Two side Hartlepool have sacked manager Paul Murray following last night's shock defeat by Northern Premier League side Blyth Spartans. Murray was in charge for just seven games, and leaves them six points adrift of Football League safety. they're providing live text coverage of the Premier League game at St James' Park between Newcastle and Chelsea. It's currently 0-0, but can Jose Mourinho's league leaders continue their fine form with victory over Alan Pardew's side. But are the Dons? Karl Robinson's men put their impressive league form on hold for the day as League One rivals Chesterfield visit Stadium:MK in the FA Cup. Football Focus may have ended on BBC One, but you can get your dose of FA Cup build-up for the eight 15:00 GMT kick-offs right here on the BBC Sport website, before we bring you all the live updates and action from up and down the country. Doncaster boss Paul Dickov ahead of the trip to his former club: "The financial aspect of getting to third round is massive. If we could get through to the third round, the prize money alone is massive. The cup run we had when I was at Oldham, we drew Liverpool at home and the money at these clubs keeps them going for the rest of the season. Is there pressure to get to the third round? Possibly." John Still (12:45) may not be whole-heartedly going for glory in the FA Cup, but Cambridge United boss Richard Money is, as he hopes his League Two side can see off divisional rivals Mansfield today. The U's are looking to reach the third round for the first time since 2008, where they lost narrowly to Wolves. Money told BBC Radio Cambridgeshire: "This will be a really important day for the supporters and players, because everyone wants to be in that third-round draw. "Last year we got the big tie as a Conference club against Sheffield United. "This year we have a game that both teams think they can win and the big prize is the next draw." One non-league team whose fortunes could be changed is that of Blyth Spartans, after their 2-1 victory over League Two Hartlepool last night. Blyth's Stephen Turnbull joined a list of great FA Cup free-kick goals in levelling proceedings - but how do you score THE perfect one? Let this BBC iWonder guide talk you through it. Power, angles, spin - it's all covered. BBC Sport's Mark Clemmit: "We have three all non-league ties which means we are going to have three non-league sides in third round. What an incentive that is, it could change the fortunes for clubs for the next decade."